Counters are used in the majority of PLC programs. This is especially true if part of your SCADA system. Counters like the animated picture above count things. In this situation we are counting the number of turns the little guy makes. The counter is displaying the total number. This is considered a totalizing counter. If an output turned on to do something then it would be a preset (target number entered for the count) counter. There are also a wide variety of off the shelf industrial counters that you can use. The implementation of counters can be vast, however it all starts with a TIMING CHART. This is the same as the timing charts we discussed in ‘The Secret of Timers’ post. A timing chart is the secret behind understanding of the counter that you need in your application. Making a timing chart before writing the program will ensure that all of the information will be accounted. As you can see in this timing chart, you have an input, output and display. Inputs are used usually sensors that are wired to the counter (PLC) to indicate the items that we need to count. They can be switches, photoelectric sensors, proximity sensors, encoders, etc. 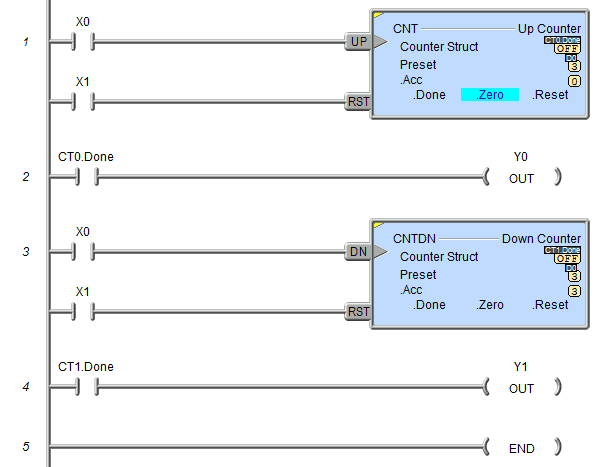 (Wiring of NPN / PNP devices) A counter will generally have only one input. In the case of an encoder input it is still only one input, however this is wired usually as a A, B and Z phase. Z is always the reset. A and B indicate the pulses and are leading or trailing each other by 90 degrees depending on direction. Allot of counters will also allow you to as a direction input signal. However this is all still only one input. Outputs from counters are generally discrete. This means that they are on or off, similar to the inputs. Outputs will trigger when the count value matches the set value. The duration that the output is on depends on the reset signal, to start the count again. (DC Solenoids protection) Allot of the counters today will allow you to have multiple outputs. 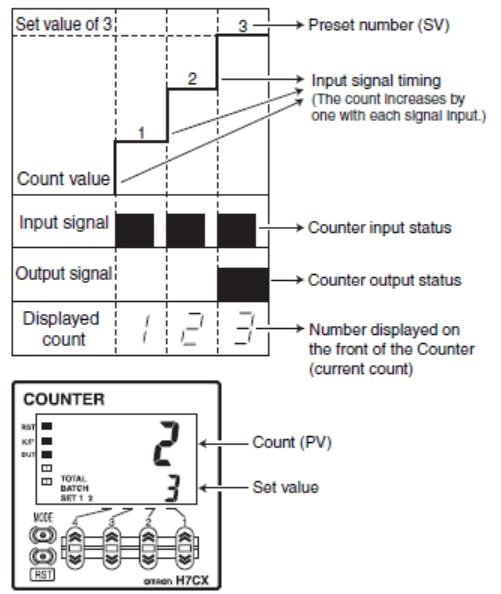 These multifunction counters can have several preset outputs that trigger when the counter set value has been reached. Batch outputs are also available on some of the industrial counters. A batch output counts the number of times that the preset has been reached. This output will be turned on when the number entered for the batch has been reached. This is usually on the display and shows the preset value. It is the target number of counts. This is usually on the display and shows the current or accumulated value. The PLC programming is usually not that much different then the industrial counter. Allot of the manufactures will have an up counter, down counter and/or an up/down counter. Just as the name implies the display is either counting up or down. You have to refer to the instruction manual of the manufacturer you are programming for the way in which the counter will be programmed. The preset value is stored in memory location D0. This value is set to the number 3. When the present value (accumulated) reaches the set value (preset) then the CT0.Done bit goes on and the output Y0 is active. Y0 will remain on until the reset input goes on. The only difference for down counter is the display. You will see that the present value will count down to zero (0) before the CT1.Done bit is turned on. Every PLC has counters. They all have different types depending on what you are trying to achieve. It will all start with your Timing Chart.